Woodland Cemetery is privately owned by anyone who has purchased a plot there since the 1850s (or, as it may currently be, their heirs). It is run by a board of managers who must be the proprietor/owner of a plot with family buried in Woodland Cemetery. Board members are all unpaid volunteers who joined the board hoping to revitalize the cemetery to a more active, respectable state. In the more recent past, a maintenance and preservation fund was established for the continued care and maintenance of the cemetery. The cemetery can only spend the income generated by the trust, but none of the principal of the trust. 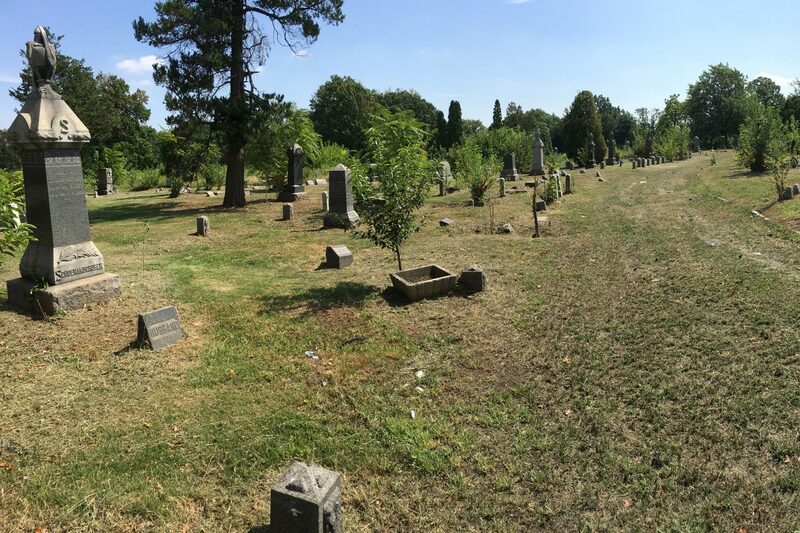 Unfortunately, the trust does not generate enough income to provide for the proper care of the entire cemetery, which is almost 37 acres of land. There are no owners who pay for any care or upkeep of the cemetery or even individual grave sites. The board has created a multi-year plan for the cemetery commencing at the South 10st cemetery entrance and then working easterly as income allows. In 2016 Phase 1 was established and maintained. Then in 2017, Phase 2 was added. Both phases are maintained and cut throughout the year by a professional cemetery maintenance company. This cut area extends from the S10st entrance to the Cypress and Oak Avenue carriageways located within the cemetery. Additionally, all remaining carriageways throughout Woodland Cemetery are cut. These are the first and second phases of the manager’s restoration plan and utilize all of the available Maintenance and Preservation income. In 2016 Section 10 was developed offering new affordable graves and ash plots for sale. It is the intention that all revenue generated from new Section 10 sales will be allocated to advance the continued maintenance of the cemetery. New Section 10 is fully maintained within the scope of Phase 1. If all goes well, the cemetery should be mostly restored by the end of the plan. If funding comes up short, the plan will be modified as needed. Headstones that have been knocked over or are face down can be reset. Please see rates of service or e-mail a board member for pricing. The board will also continue to assist families in obtaining military headstones for veterans with unmarked graves. There is no charge for assistance in this matter and veteran stones are installed free of charge. We welcome donations from those wanting to contribute and offer “how-to details” on our donation page. Thank you for your consideration–you can make a difference.